Winter is a great time to find yourself in Northern Italy. Free of the dense summer tourist crowds and with a rich calendar of events, the larger Northern Italian cities as well as the smaller local towns are a delight to explore. On most days the sun shines brightly and the skies are blue. It’s true, it may get rather chilly and a bit foggy every now and then but it’s nothing that a thick jacket and a nice cup of Italian hot chocolate can’t beat. A nice snowfall is guaranteed in the Alps and the Dolomites. And while you can’t swim in the sea and the many Northern Italian lakes, numerous spa resorts tempt you with gushing mineral springs feeding large swimming pools and whirlpool tubs. In terms of major events, you have Christmas, New Year’s, St. Valentine’s, Carnival and International Women’s Day. All of this is intertwined with many large art exhibitions and cultural events. So, the three months of winter in Northern Italy offer a lot to see and enjoy. Not to mention the many truly scrumptious (and sometimes even healthy) things to eat – from Carnival frittelle with creme patisserie to the tender local leafy green – broccolo fiolaro – the season of which starts in January. 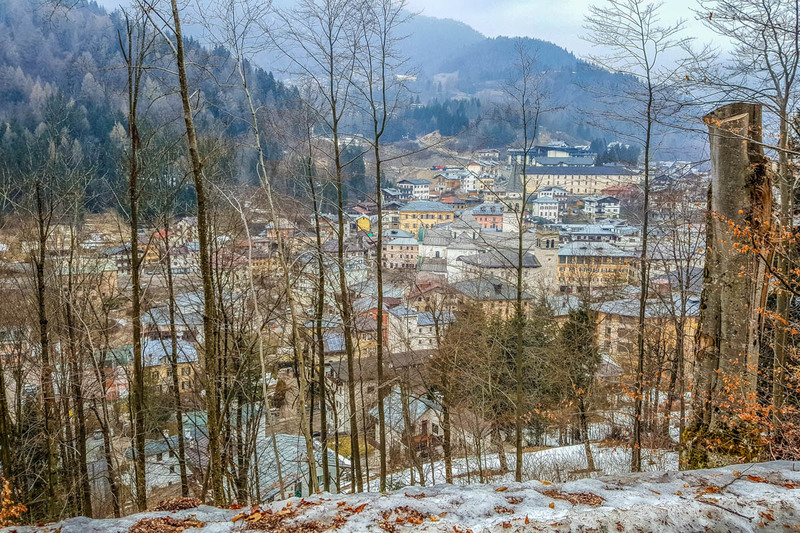 As such, here is a nice and tidy list with twenty-five exciting things you can do this winter in Northern Italy. I hope that you find it helpful when you plan your weekend break, your family trip or your solo exploration of this beautiful part of the world. For ease of reference, all of the suggestions below apply to the astronomical season of winter starting on 21st December and ending on 20th March. 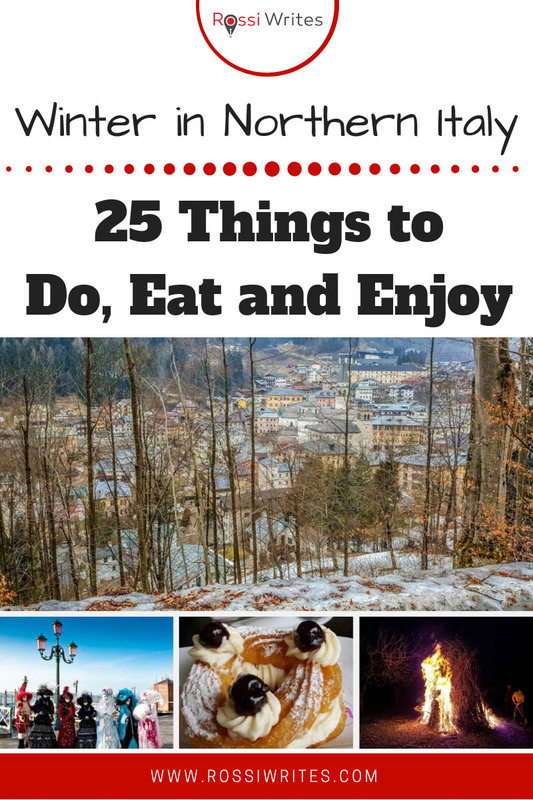 Keep an eye on my blog, as soon I will post similar lists with suggestions for things to do, eat and enjoy in Northern Italy respectively in summer and autumn. The list for spring is already at this link. One more thing to get out of the way before we dive in. Geographically, all of the suggestions below refer to the eight Italian regions that together comprise the body of Northern Italy. They are Aosta Valley, Piedmont, Liguria, Lombardy, Emilia-Romagna, Veneto, Friuli-Venezia Giulia, and Trentino-Alto Adige (South Tyrol). 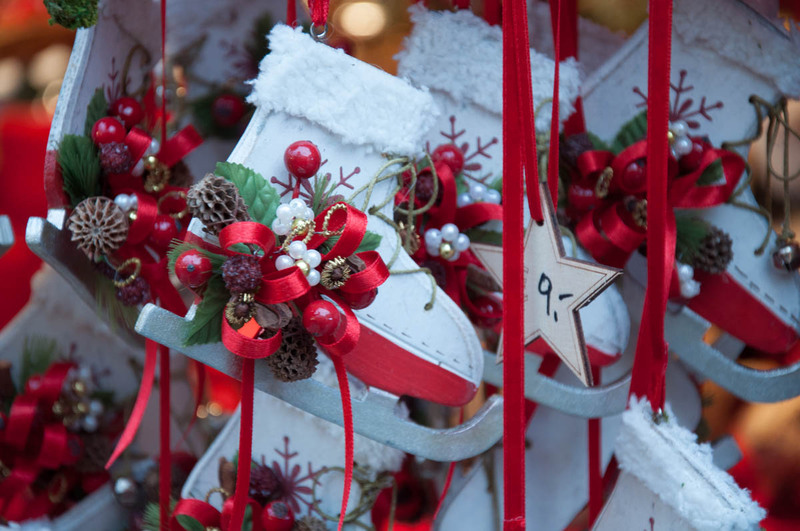 Northern Italy has many great Christmas markets offering lots of fab shopping, vats of mulled wine, and lashings of festive atmosphere. Particularly famous are the Christmas markets in the autonomous region of Trentino-Alto Adige (South Tyrol). 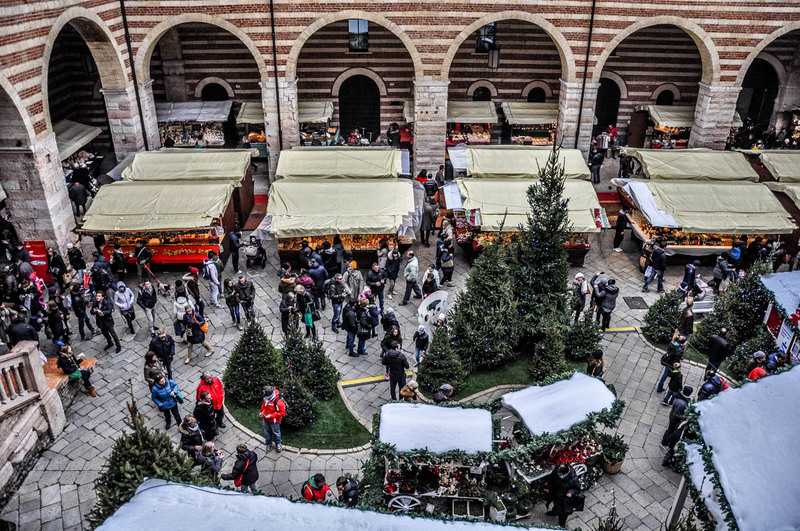 Yet, anywhere from Turin to Verona and all around the Northern Italian lakes, you are bound to come across many Christmas markets – some being set up for a day and some lasting almost two months from the middle of November to Epiphany on 6th January. 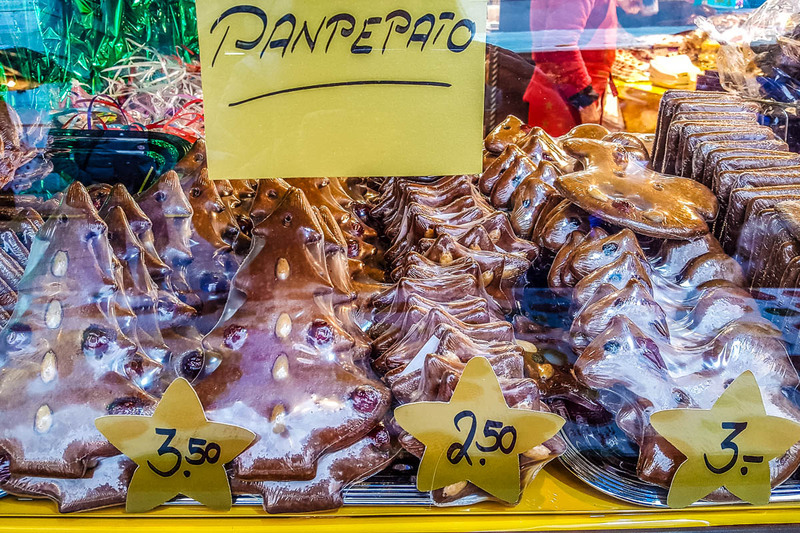 From panettone to pandoro, from torrone to panpepato and from marron glace to tronchetto di Natale, winter comes to Northern Italy bringing at least a dozen seasonal sweets and cakes. Make sure that you have a slice or two of each in order to decide which one you love the most. Try both the supermarket versions (from the simplest to the most luxurious ones) and the ones made in local artisan patisseries. This will help develop your appreciation for the Northern Italian festive sweets and cakes. Spending a white Christmas is a deeply entrenched Western European dream. You may have never thought that Italy (famous for its sun and beaches) could be the country to help you live your snowy dream. Yet, if you head to the small picturesque villages and the ski resorts of the Northern Italian Alps and the Dolomites, it is perfectly reasonable to expect a Christmas snowfall. The price tag will match. If it is a once-in-a-lifetime experience though, then why not treat yourself?! 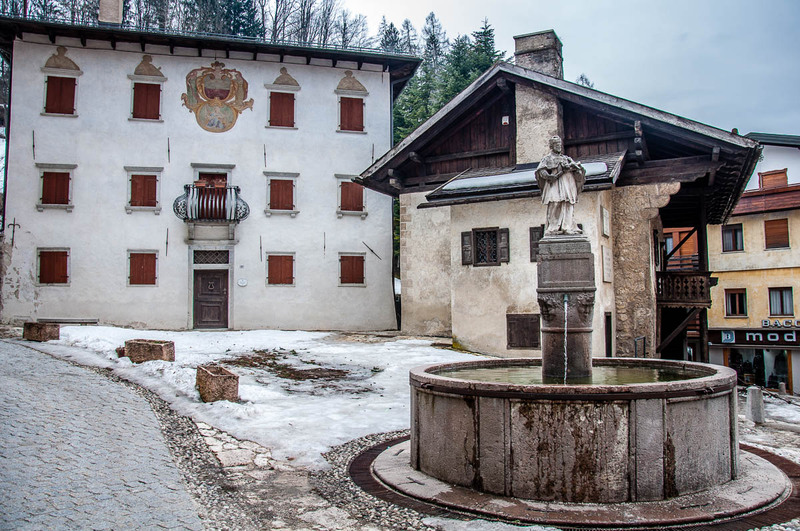 Look into Trentino-Alto Adige, the Aosta Valley and the Venetian Dolomites. Capodanno is Italian for New Year’s Eve/New Year’s Day – from capo (head, boss) and d’anno (of the year). New Year’s Eve celebrations in Italy are traditionally held on the central squares of large cities and smaller towns. People get together for loud music and impressive firework displays. 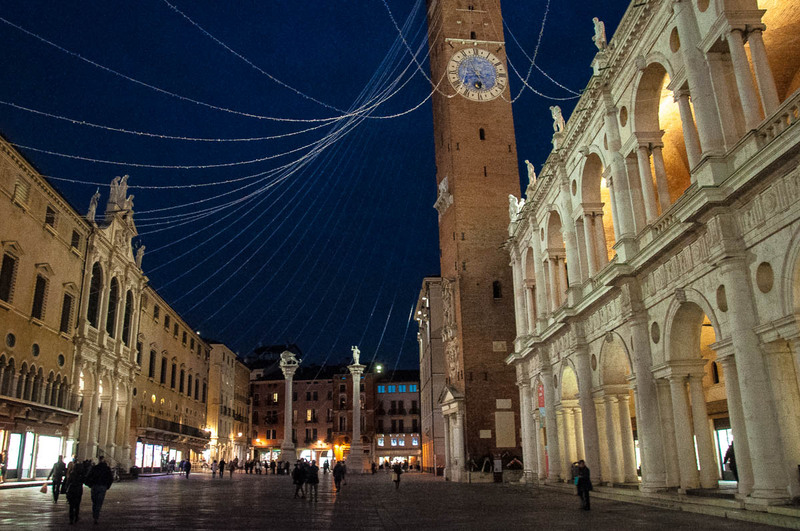 Particularly famous is the Capodanno event in Ferrara which attracts thousands of people each year. At midnight large fireworks literally seem to set on fire the majestic Castle of Este in the centre of the Rennaissance city. Italians can be a bit pazzi. That means ‘crazy’ in English. In the best possible way, though! They come with some crazy ideas and then make them happen. Like the New Year’s swim-offs that take place in the icy waters of the Venetian Lagoon and Lago di Garda! If on 1st January you find yourself either on the Venetian island of Lido or in the town of Riva del Garda which is on the shores of Italy’s largest lake, head over to the beach. As this is where the local club of Ibernisti (or ice-swimmers in English) will take a cold, cold dip to celebrate the start of the New Year. Be warned! 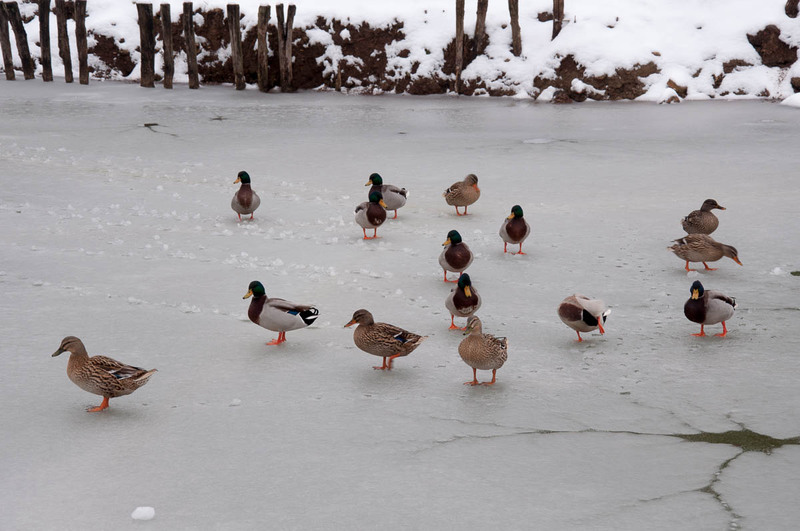 You may need an extra glass of mulled wine to warm up after simply watching them having their fun in the icy waters. 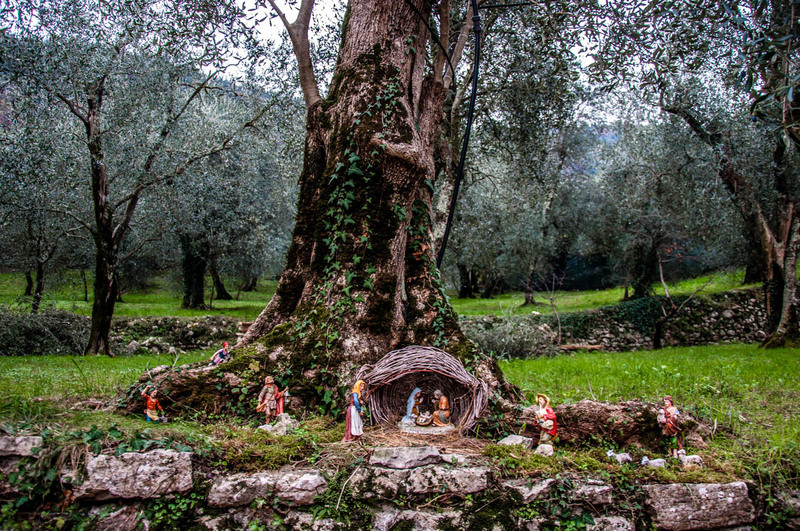 Nativity Scenes are a central part of the Christmas celebrations in Italy. Also known as a manger scene or a crib in English, they are called presepio or presepe in Italian and are carefully arranged in churches, city squares and private homes all over the country. The Nativity scenes represent the Holy Family in the stable. They can be small with tiny figurines or human-size. In many places, the whole town of Bethlehem is recreated in minute detail around the stable – from the marketplace with all sorts of stalls and craft workshops to many different animals, houses and even people going on about their daily lives. Italians really pull out all stops in terms of Nativity Scenes. Between December and January, you can spend a happy afternoon in a large Northern Italian city like Turin, Milan or Venice simply traipsing from church to church to admire the Nativity Scene lovingly set-up in each one of them. Or you can head to a medieval village in the mountains of Northern Italy where dozens and hundreds of Nativity Scenes have been dotted all through the cobbled streets, in the roots of large trees, in the stone walls of the gardens and any other possible place you can imagine. 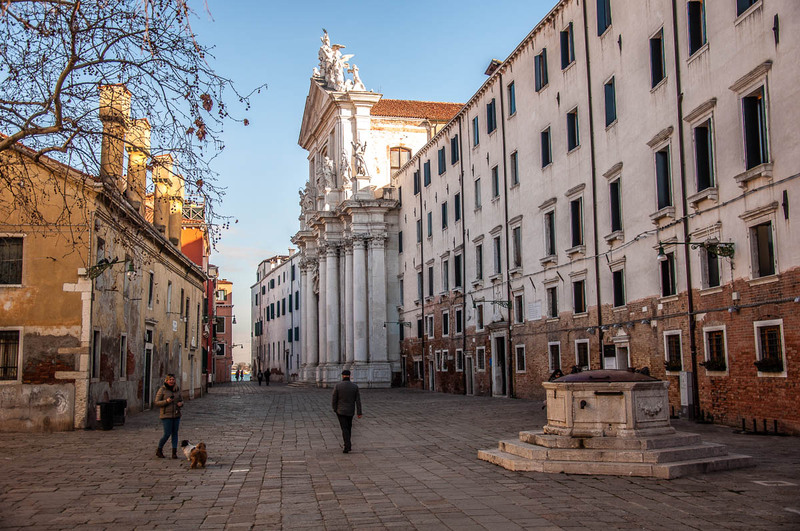 If you happen to be in Northern Italy on Epiphany – 6th January – head to the central square of the town or city you are in. Chances are, there will be a large event for kids at which an old lady riding a broom and having a rather unfortunately large nose will be the guest of honour. This is Befana – a Christmas gift-bearer unique to Italy. She visits the good and not-so-good Italian children on the night of the 5th to the 6th January bringing sweets and presents for the former and a piece of coal for the latter. In 2019, Italy marks the 500th anniversary of the death of one of its most renowned sons – Leonardo da Vinci. Events and happenings dedicated to his genius will be taking place all over the country all throughout the year. In Northern Italy and, most importantly, in Milan, there will be a rich palette of events officially starting on 2nd May 2019. After all, Leonardo spent 17 years in Milan – the most productive period of his life. Even though the bulk of initiatives will be held come late spring and then summer 2019, this winter you can still get close to Leonardo in Milan. Head over to the city’s National Museum of Science and Technology to see Leonardo da Vinci Parade – an exhibition of real-life models constructed following Leonardo’s designs. Also, don’t miss the Leonardo3 Museum and trace Leonardo’s footsteps all over Milan with the help of the detailed information and apps prepared by the city’s tourist board. There are dozens if not hundreds of festivals, fairs and exhibitions taking place all over Nothern Italy this winter. From the Motor Bike Expo in Verona in January to the International Record and CD Fairs in Genoa and Bergamo in February, from the Fair of Sant’Orso that has been held in the Aosta Valley for more than a thousand years to the Live Wine artisan wine event in Milan in March, Northern Italy is brimming with exciting happenings vying for your attention. Italy is the country of music and Northern Italy is the birthplace of many composers whose names we all know no matter how big or small our knowledge of classical music is. For example, Monteverdi and Vivaldi. In addition, the acoustics offered by the numerous churches and specially built opera houses are parallel to none. Enjoy a concert during your time in Northern Italy. It could be a lunchtime performance in a church in a medieval walled town or a lavish opera in the worldwide known Teatro alla Scalla in Milan or Teatro La Fenice in Venice. You will leave with a new appreciation for classical music and a memory to last you a lifetime. 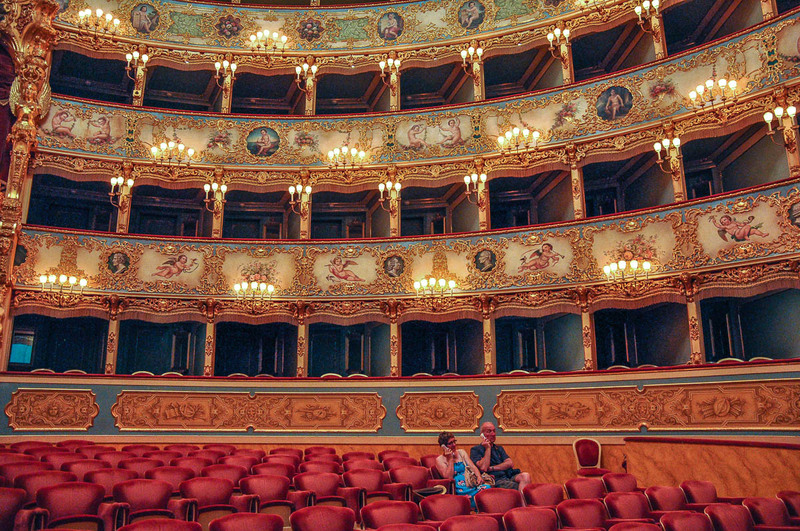 By the way, if your budget doesn’t really stretch to purchasing a ticket for the Northern Italian opera houses (they can be very expensive, I know! ), look into visiting them during the day when they open their doors to tourists for a very reasonable fee. The Italians have come up with a genius solution to keep the winter chill at bay. During the cold months of the year, they indulge in cups of hot chocolate. 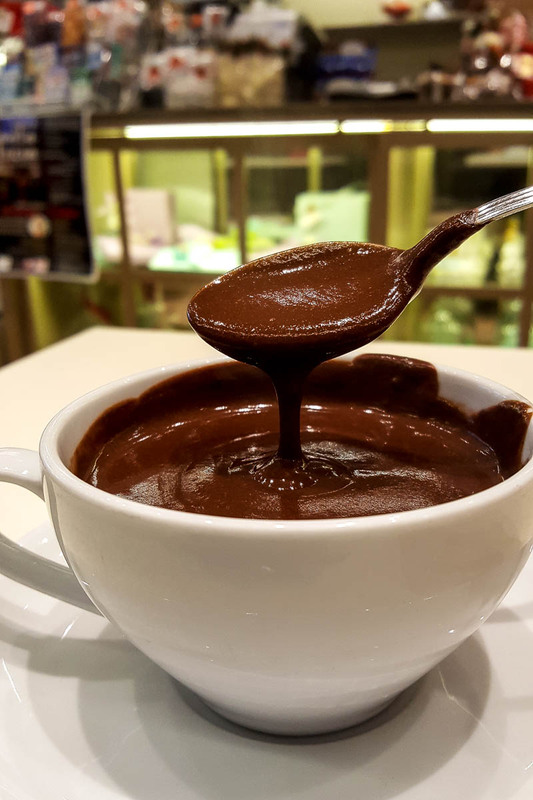 Known as cioccolata calda in Italian, this is a seriously thick and gooey drink which, if you wish, can be crowned with a mound of freshly whipped cream. It’s heaven after a long day of sightseeing around churches and museums. The retail sales are a big thing in Italy. They happen twice a year – once in January and once in July – and can last up to six-eight weeks each time. As you can imagine, Italy has some of the best shopping in the world. 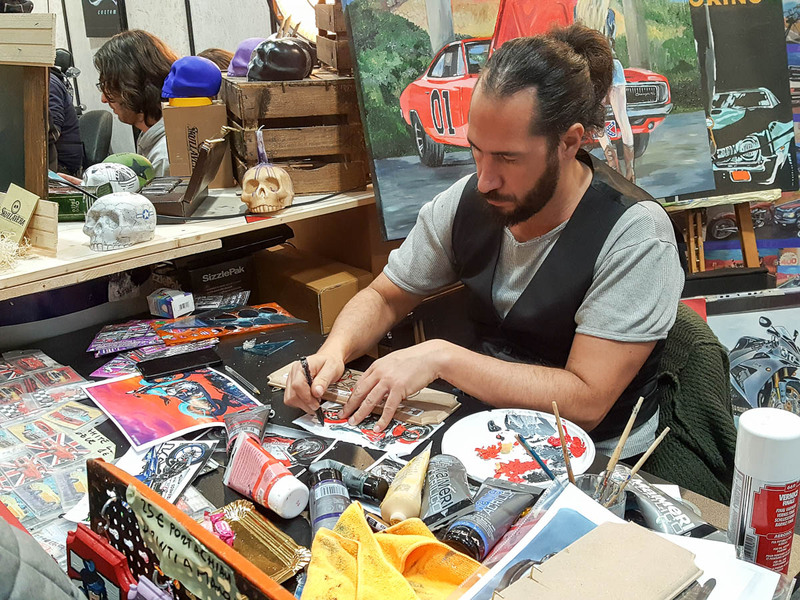 With the home-grown high fashion designers and the myriad of local artisans, there is a never-ending stream of opportunities here to buy some lovely stuff. Clothes, ceramics, jewellery… Anything your heart desires you will find it in Italy. If you can wait until the sales (called Saldi in Italian), you can get it all at a snip of the original retail price. Especially towards the end of each sales period. Flanked by the Alps and the Dolomites, a great part of the winter appeal of Northern Italy lies in the opportunities it gives to winter sports aficionados to practice their sport. Opportunities for skiing, sledding and snowboarding abound. From expensive resorts to cheap pistes and sledding hills, there is something for everyone no matter how deep his pocket is or what is his level of snow skill. 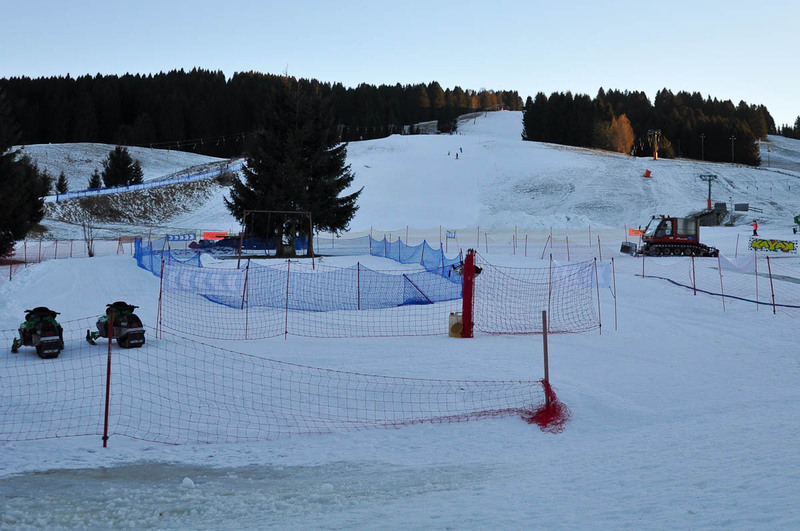 You don’t have to trek all the way to the mountains in order to practice a winter sport in Northern Italy, though. In all its largest cities and smaller towns, temporary ice rinks are set up in December and remain there until the end of January. Or even until the beginning of March as it is the case with the ice rink at Campo San Polo in Venice in 2019. Skates can be rented on site. There are even supports shaped like cute polar bears and penguins to help the newbies in the sport. Glide away! The best bit is that these temporary ice rinks are set up on some of the most beautiful Northern Italian historical piazzas. So, you can skate and admire world-class architecture at the same time. A sagra (pl. sagre) is a food festival dedicated to a particular foodstuff which is locally cultivated or produced. It could be peas, a particular type of salami or even cherries. All the food served at the festival will be based on the foodstuff to which the sagra is dedicated. If you find yourself in Northern Italy in winter, don’t miss to tick a sagra off your bucket list. These food festivals are a lot of fun. The food is very reasonably priced and very tasty to eat. Plus, you will be surrounded only by locals. In the Veneto, a particularly popular winter sagra is the one dedicated to the broccolo fiolaro – a leafy green which is cultivated in the area of Creazzo in the province of Vicenza. On 17th January Italy celebrates the day of St. Anthony the Abbot. Also known as St. Anthony the Great and the Father of all Monks, he was a Christian monk and hermit from Egypt who lived an ascetic life renouncing all worldly temptations. St. Anthony the Abbot is often depicted with a pig at his feet. Some believe that this is because he spent several years of his life working as a swineherd. Others think that the pig is a symbol of all the temptations that the devil sent to the saint to test his faith and resolve. Nowadays, the Saint is venerated as a protector against the devil and as the patron of all farm animals. A legend from the Northern Italian region of the Veneto states that on the night of the 17th January the animals acquire the skill to speak. On this night, the farmers had to stay away from the stables as overhearing the animals talking was believed to be a sign of bad luck. The Day of St. Anthony the Abbot is celebrated by rural communities all over Italy. In the northern part of the country, the Saint is widely celebrated in the region of Lombardy where bonfires and other events are organised in his name. Some of the most well-known celebrations take place in Barni (a town in the province of Como), and Lonato del Garda (a town in the province of Brescia). In Barni, people give gifts to the Saint in the form of local agricultural products like salami, vegetables, fruit and cheese. The gifts are sold at an auction held on the 17th January and the proceeds are donated to the parish. In Lonato del Garda, the Day of the Saint is marked with a fair which has been held there since ancient times. 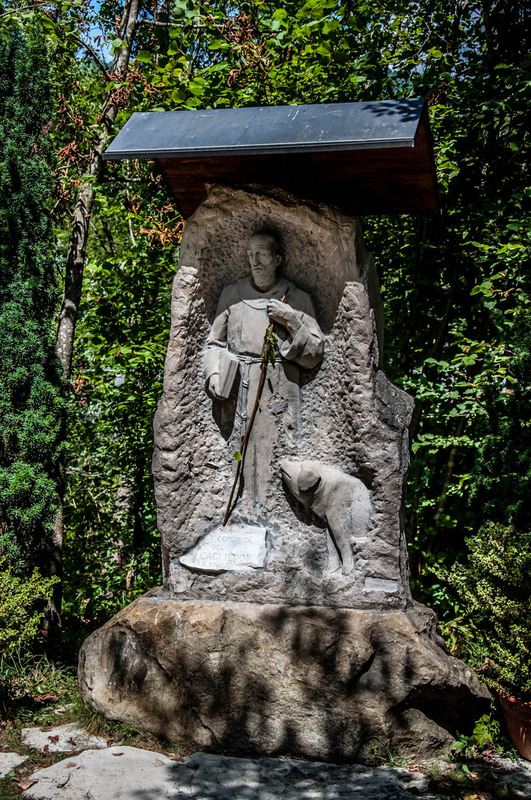 An integral part of it is the Blessing of the Animals which takes place at the square in front of the Church dedicated to St. Anthony the Abbot. Italy is one of the world’s most romantic countries. There are no two opinions about that! Spending St. Valentine’s Day here is a no-brainer if you want to impress a special someone. jewellery shopping in the Italian Meccas of gold- and silver-working like Vicenza in the Veneto and Valenza in Piedmont. On the other hand, you can head to Verona – the City of Love – and live your own Romeo and Juliet story with, obviously, a happy-end. 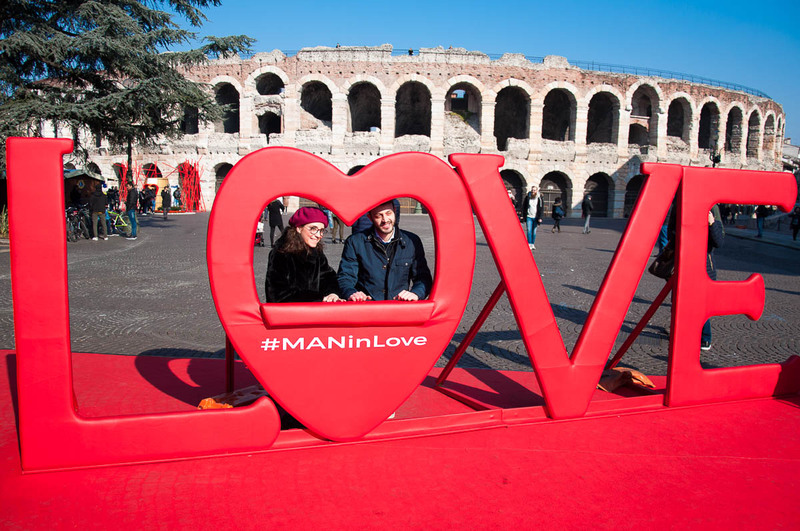 Every year, in the days leading to the 14th February, Verona stages a city-wide festival under the slogan of Verona in Love. 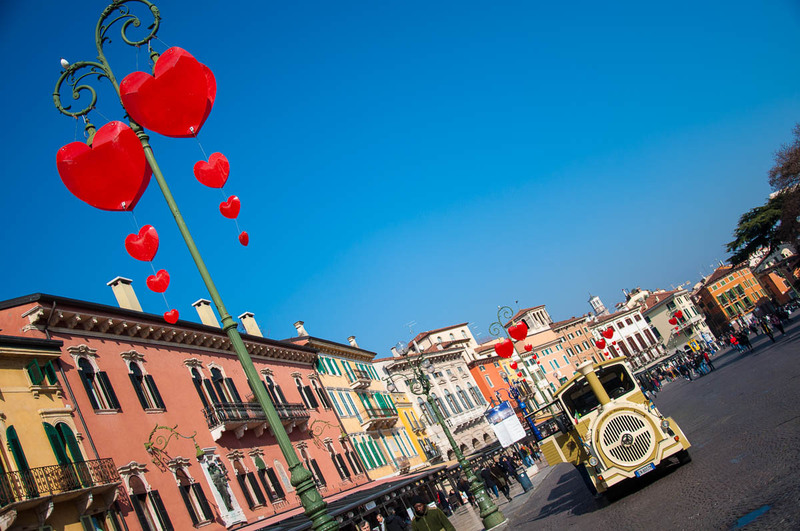 There are lots of romantic events taking place all over the beautiful historical centre of the city. It’s definitely a festival to experience holding the hand of a loved one. And, thirdly, you can do something even more original on the 14th February here in Northern Italy. Namely, you can head to the small Church of St. George (Oratorio di San Giorgio) in the town of Monselice, Veneto. You will find it attached to the splendid Villa Duodo on top of a rolling hill overlooking the medieval walled town below. Inside the Church of St. George and among relics of the first Christian protomartyrs, you will find what the locals assume to be the remains of St. Valentine himself. Every year, on 14th February, the town stages a large celebration dedicated to the Saint. An important part of it is that each child receives a golden key which is believed to protect him or her from the bad eye and epilepsy. Spending a Carnival season in Northern Italy should be on the bucket list of every traveller who wants both to have fun and to learn more about centuries-old traditions preserved to these days. 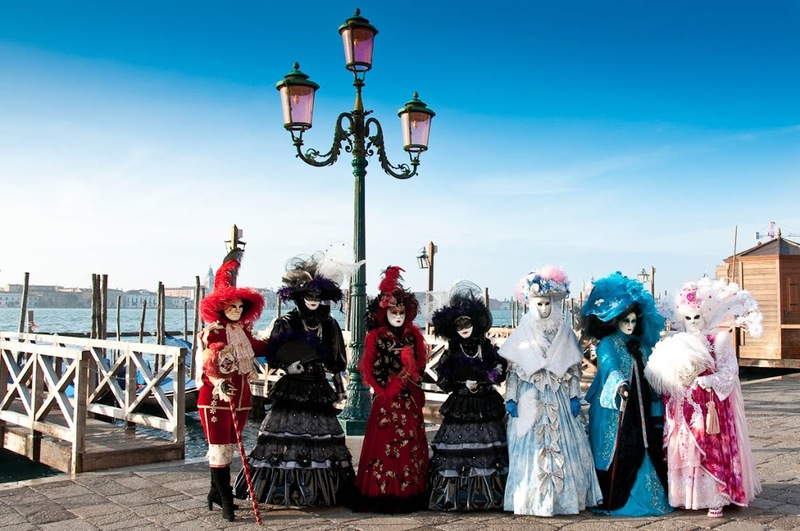 Obviously, the Carnival in Venice is the one attracting the most column inches with its phantasmagorical costumes and lavish balls which cost a pretty penny to attend. Yet, the Carnival Season lasts between two and three weeks and takes over the whole of Northern Italy. Happy, loud celebrations take place under clouds of confetti. Huge floats adorned with colourful paper-mache figures parade through the central streets and squares of small towns and large cities. In addition, the Carnival period brings up to the surface centuries-old traditions which are still honoured in small mountain villages. 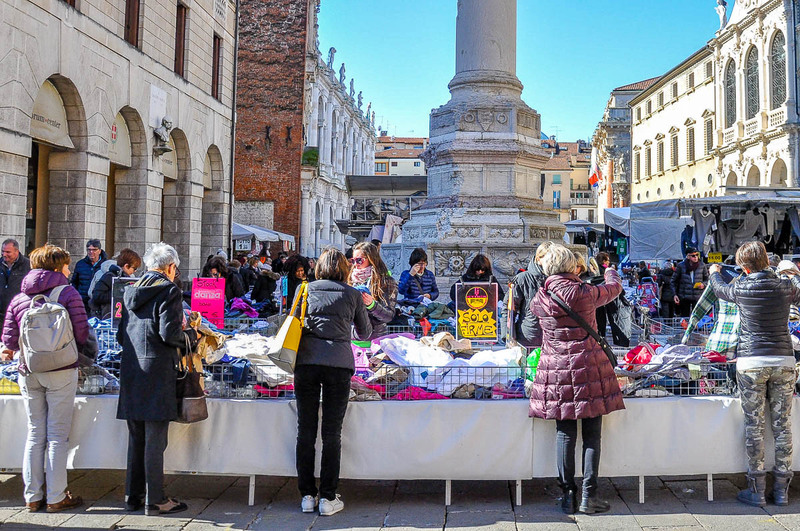 If you find yourself in Northern Italy during Carnival, make sure that you experience its many facets in as many different towns and places you can visit. The links below will give you some inspiration. Crostoli are thin crisps of fried dough generously sprinkled with icing sugar. Bugie are small pieces of crisp fried dough which are stuffed with chocolate, jam or creme patisserie. 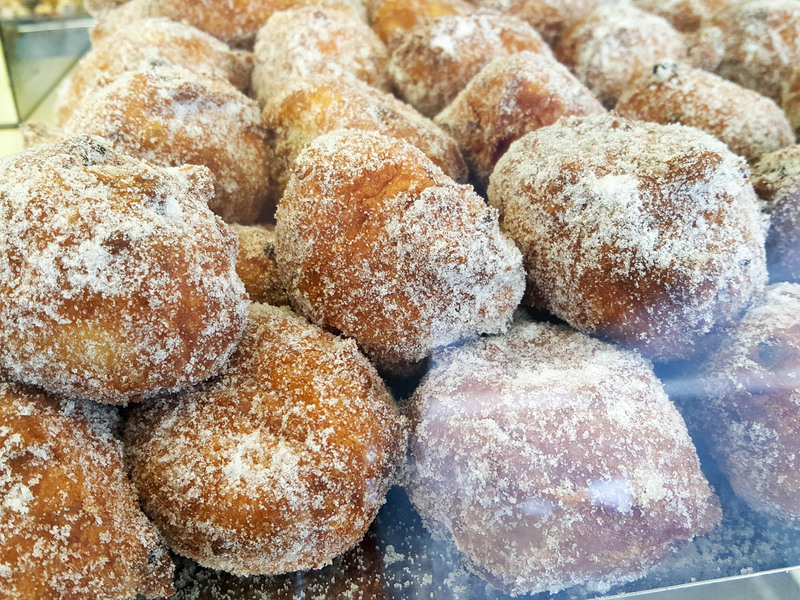 Frittelle, are balls of fried dough studded with raisins and served either as they are or stuffed with creme chantilly, chocolate, zabaione or creme patisserie. They can be as small as a cherry or as big as a tennis ball and cost anything from 15 to 30 euros per kilo depending on where you buy them from – the local supermarket or a refined patisserie where everything is baked on the premises following recipes passed down from generation to generation. Did you know that for hundreds of years the Republic of Venice celebrated the beginning of the New Year not in January but in March? This was in direct reference to the traditions of the Veneti – an Indo-European tribe which used to populate the lands of the Northern Italian region of the Veneto as far back as the 8th century BC. The Veneti used the ancient Indo-European calendar according to which the year had only ten months and started in March with the re-birth of the earth after the long winter. Curiously enough, in Venice and Veneto, the tradition to celebrate the New Year in March survived through the centuries and against two major calendar reforms (the Julian and the Gregorian). Initially, the Venetians celebrated the arrival of the New Year on 25th March – to commemorate the day on which Venice was founded in 421. Later on and in order to simplify their calculations, the Venetians moved their New Year celebrations to the 1st March. This continued until the fall of the Republic of Venice in 1797. 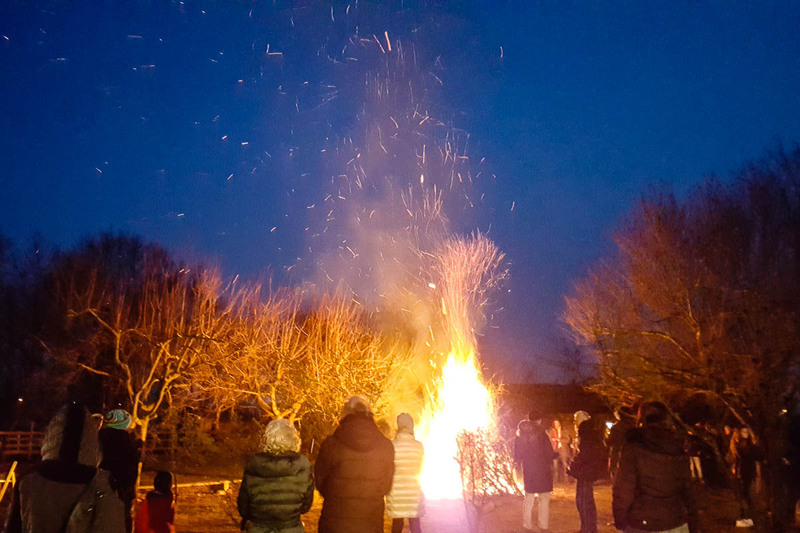 Nowadays, attempts are made by grass-roots organisations in and around Venice to revive the old tradition of celebrating the beginning of the New Year in March with a large get-together around a huge bonfire signifying the end of the old and the beginning of the new. The ritual is called Batimarso. 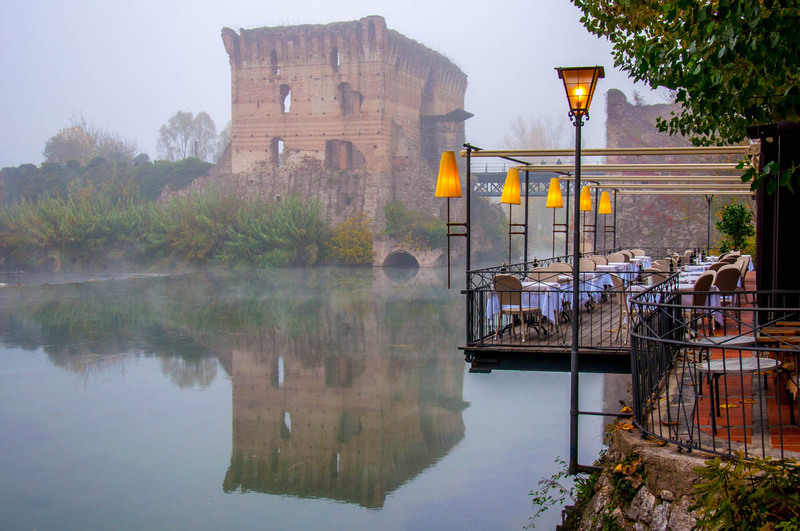 Head to Ivrea in the Northern Italian region of Piedmont at the beginning of March for the most surreal experience of your life. This is where and when a worldwide known festival takes place. Based on an ancient tradition, for the four days of the Ivrea festival, people throw oranges at each other. Yes, oranges. Like, in the fruit. Whole oranges at that, with the peel et al. Definitely not for the faint-hearted. Click here to see what I mean. 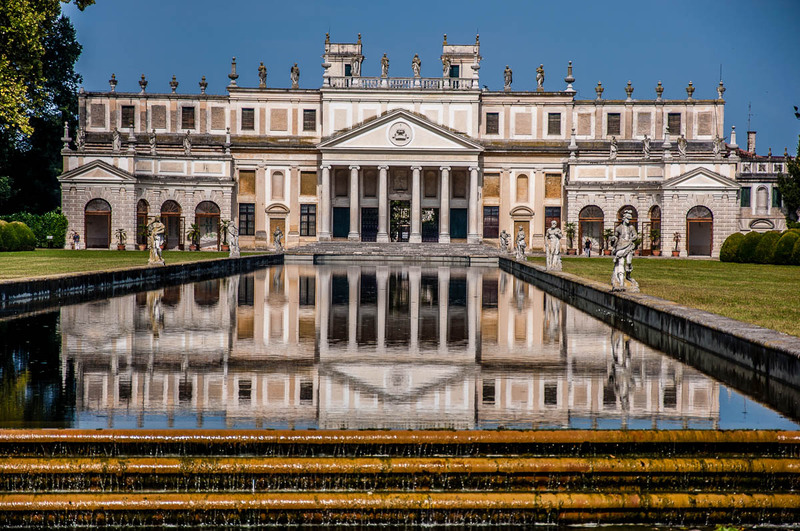 From January to March, every first Sunday of the month gives you free entry to over 480 state museums, archaeological parks and art galleries all over Italy. In addition, entry to them will also be free for a whole week in March 2019 (from the 5th, Tuesday, to the 10th, Sunday). Click here to check the full list with participating museums and cultural establishments. International Women’s Day on 8th March is widely celebrated in Italy. On this day, Italian ladies receive mimosa sprays covered in tender yellow blooms. You will see mimosas everywhere in Italy in the days leading to the 8th March. Even cakes in the local patisseries are adorned with them. At the same time, Italian women are increasingly fighting for their rights and against several deeply entrenched forms of gender discrimination. This article gives you a good idea as to what it means to be a woman in Italy nowadays. Father’s Day is celebrated on 19th March in Italy. It coincides with the Feast Day of St. Joseph (San Giuseppe in Italian) who was, obviously, the husband of the Virgin Mary and a father figure to Jesus. Traditionally, on this day, people treat themselves and their father to zeppole. This is an Italian pastry with a deep-fried or baked choux pastry base which is then filled with pastry cream (or custard, jam, or a mix of butter and honey) and crowned with a sugared cherry or a small dollop of chocolate spread. It’s rather yummy! 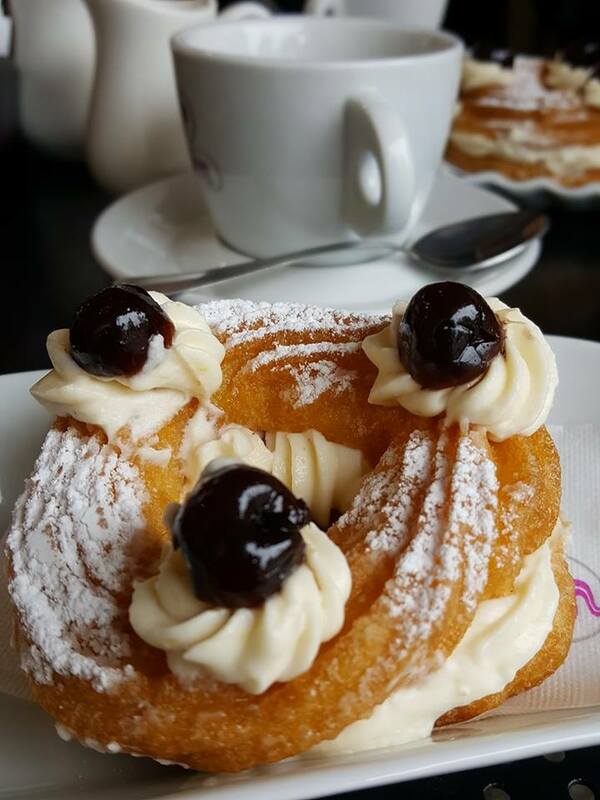 You will find zeppole being sold in every self-respecting patisserie and bakery in Italy on Father’s Day. If you find yourself in the region of Emilia-Romagna around the Feast Day of St. Joseph, head over to Trebbo di Reno in the province of Bologna. This is where the Feast of the Raviola takes place on the third Sunday of March. Raviola being a type of pastry filled with mostarda bolognese (a type of marmalade with a mustard kick). A brand new museum opened its doors in Ravenna in December 2018. Its name is Classis Ravenna Museum of the City and the Territory. The museum explores the history of the Fleet of Ravenna (Classis Ravennas) which was the second most senior fleet of the Imperial Roman Navy. Another new museum opens its doors in Northern Italy in December this year. It’s called Lumen and it is dedicated to the art of mountain photography. Lumen is quite an extraordinary museum as it is located at a height of 2275 m on top of Mount Kronplatz-Plan de Corones in the heart of the South Tyrolean mountains and the Dolomites. 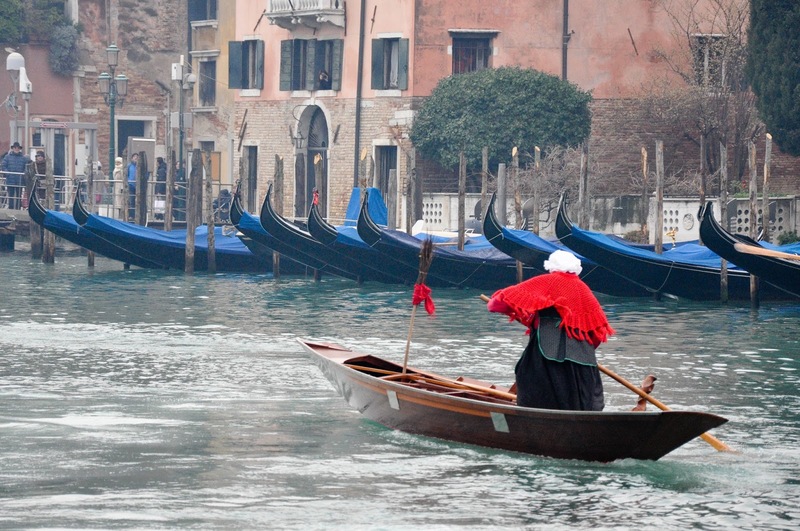 Winter is a great time to find yourself in Northern Italy! From centuries-old Christmas traditions to sparkling New Year’s celebrations, from snowy mountains to cities full with events to enjoy, from seasonal sweets and pastries to indulge in to lively Carnival events, there is a wide palette of experiences for everyone to choose from in accordance with his or her tastes and expectations. Enjoy Northern Italy in winter! ‘Tis the season to be happy! Let me know which of the above suggestions you would like to experience yourself this winter in Northern Italy. Also, have I missed something? An event, a festival, an idea for a great winter happening in one of the eight Northern Italian regions? Let me know in the Comments below!